A total of 29.8 million working days were lost to work-related illness in 2003-04, and 2.2 million people suffered from an illness they believed was caused or made worse by their current or past employment, according to findings from the Health & Safety Executive (HSE). 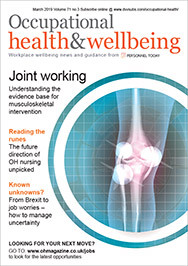 The figures – which were more detailed than initial figures published last November – showed that on average, each sufferer took an estimated 22 days off work during that 12-month period. Averaged across the working population, this represented an annual loss of 1.3 days per worker. Musculoskeletal disorders, followed by stress, depression or anxiety, were by far the most commonly reported types of work-related illness, with corresponding estimates of 1.1 million and 600,000 people reporting a current or past illness. Although the estimated annual working days lost were similar for the two conditions, the average number of annual days lost per person was higher for stress, depression or anxiety (28 days) than musculoskeletal disorders (19 days). But the rate of new cases of work-related illness in 2003-04 decreased from the 2001-02 rate, said the HSE. Much of this was due to a fall in musculoskeletal disorders – particularly those affecting the back.